He's just gorgeous Lien! The two photos where he is in the stripey shirt holding up a stick - he looks like a baby clothing model. It's really cool that you guys get to have so much fun, especially as you and Jef both work. 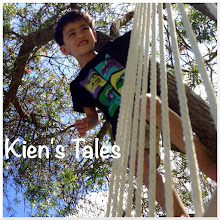 You always manage to find time to make sure that Kien's days are filled with learning and interacting with other people. I have to say it is something I really admire. I think I am so shy that Thomas will miss out a lot, but I am trying to get brave for his sake. Other mothers and children make me so nervous. I felt the same way about other mothers, but honestly once you start interacting with them the easier it becomes. If you are keen why don't you bring Thomas to playgroup? It's really easy and everyone is so nice.